There is nothing like a steamy bath when you need. The solar shower is a portable shower system which lets you have the steamy bath anytime and anywhere. Solar showers have impressive heating systems that utilize the sun, a portable ﻿﻿shower bag which holds water for multiple showers and other benefits. This article explains why you would need solar showers and enlists few of the best solar showers available in the market! I have spent hours analyzing the features of each of the best model, and prepared this final comparison and in-depth solar shower review for each of them. 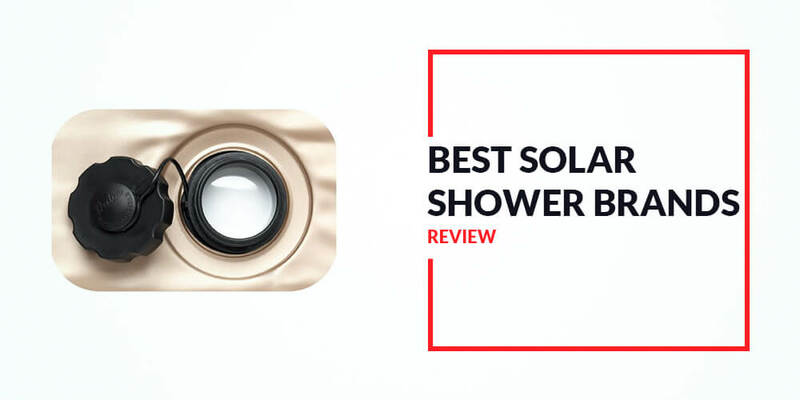 If you are still confused which one is the most perfect solar shower for you, check our in-depth reviews to decide the final one! GAME 4376 Outdoor Solar Shower is a compact outdoor shower which is easy to connect with any source. Simply add it with the garden hose and you are done! This solar panels work quickly to heat up your water. You can even adjust the temperature of the shower water to your liking. Once you are done with it, simply put it on a base that comes with this shower. The manufacturers also have made few showerheads that will go well with the bag. For example, you can try on the rain showerhead with it and have customized flow of water. You can have fun during hiking trips or camping nights. This outdoor shower is easier to assemble than you think. Water storage capacity is impressive with 5.5 gallons when it is full. The solar shower gives you options regarding “Hot” and “Cold” water settings. “Hot Shower” is very fast with solar heating system present. You can adjust the Showerhead to suit various heights. You can set it up on uneven surfaces thanks to the stable base. Comes with a “well-rounded” warranty package. It is a bit on the “Expensive” side. The shower is fragile and can easily fall apart according to some reviewers. This Advanced Elements 5 gal. Summer Shower is designed for outdoor fun with family. The capacity of the shower is 5 Gallons which is more than even in-house showers of yours. You can have a durable outdoor shower with this as it is solar powered and 4-ply construction guarantees sturdiness for the panels. You can use the Velcro straps to keep your washed clothes. Also, there is a side pocket if you want to keep soaps and shampoos. It doesn’t even take up much space in your travel bag. It requires the space of an iPad for your convenience. Operating it is easy as well, just turn the shower on and off with a switch but you cannot regulate the shower speed. The solar shower is lightweight and easy to carry around. The shower is durable thanks to the 4-ply construction that goes into it. You’ll have a temperature gauge to tell you how hot the water is at any point of time. The “Extra Large” filling valve holds more water than most outdoor solar showers. Twisting On/Off switch provides convenience while using it. You cannot tweak around with advanced settings for this outdoor shower. This product has the capacity of 3 Gallons which makes it suitable for multiple showers. This Advanced Elements 3 Gallon Summer Shower / Solar Shower is perfect for outdoor picnics, hiking and a bunch of other activities. While taking a shower with it is easy, you can also monitor the water temperature through the gauge. It also follows a four layer construction. The construction makes the shower sturdy for continuous use. You will have carrying handle as an extra. The Velcro straps will keep the soap and shampoos in place. It is very easy to store the shower as it folds in a travel bag. You can take it anywhere you like without worrying for damages. It is the ideal choice for activities like hiking, outdoor biking, and camping. This outdoor shower system up quickly under direct sunlight. Small size and lightweight features make it easy to carry while you go for camping and hiking. Filling valve makes water run quickly for you to take shower easily. You got the On/Off control that makes showering easier than you think. The bag it folds in, is durable as well like the actual product. It has lower capacity than its more popular version. This Coleman Sun Shower® 4 Portable Shower holds up to 4 Gallons of water, so you can take multiple showers. This is particularly suited when you are on long distance journeys. While traveling, you can keep the soaps and shampoos in a well-designed side pocket. It is a showerhead perfectly suited for families. To make sure the water temperature is soothing to all, you will get a temperature gauge to monitor. It won’t puncture or tear up even if your kids drop it as it is strongly built. The solar shower is backed up by the standard warranty. As far as the reviews go, this is one of the top-selling solar showerhead brands . This is a shower that supplies water for a standard 3-people family after when full. This Sun Shower doesn’t cause the water to be toxic or any kind of pollution to the environment. Besides the bag it comes in, the handle is also strong to carry the weight of the shower. This is one of the cheapest yet top solar showers price and performance-wise. This one boasts an On/Off valve as well. This shower is made of PVA; it is durable and long lasting. You cannot get cold water shower with this product. I didn’t see any warranty tagged along with this solar shower. If you go camping a lot or you are going to need to have access to a portable shower because you will not be near running water for a while, having a solar shower such as this one right here can really help to provide you with everything you need. This particular shower is able to hold up to five gallons of water. While that might not sound like a great deal of water at first, you will find that it is more than enough water to help you take a couple showers or have multiple people shower using just one load from the bag. One of the biggest problems with a lot of portable showers is that they struggle to heat up the water in an efficient manner, but this particular shower uses solar energy to help heat the water. The handle of the bag is strong enough so that you can hang and carry the bag no matter where you go. There is an easy on and off valve connected to the shower head so that you can control the water flow. Last but not least, you will find that this is the perfect option for any camping trip or during any emergency you might experience when hot water is not available. While solar shower bags can be a real lifesaver when it comes to showering without access to running water, they’re only as good as they are big and if you happen to find a bag that is pretty small, it will be hard for you to get some great results out of it. Luckily, this particular bag is going to hold up to 10 gallons of water, which means that it holds more than enough for multiple showers by multiple people without needing to refill it. Additionally, it is made with the best materials so you don’t have to worry about the bag breaking or leaking when you are using it. The smart heat absorbing design helps to effectively and efficiently absorb the solar energy so that i can quickly and easily heat up the water inside of the bag. It can heat the water to 45 degrees celsius in just three hours assuming it is in direct sunlight for the entire time. There is also a temperature indicator included with the bag so you no longer have to guess at what the temperature is. You’ll enjoy the easy setup that includes all necessary accessories for a simple experience at all times. This is going to be another great option if you’re looking for a shower bag that will supply a few showers without having to provide for a bunch of people at a time. This is going to be one of the best options to go with for anyone who might want to hang a shower at their campsite to wash off dirty hands or feet, but it could work for regular showers as well if you think it is necessary for you to do so. It is strong and durable because it is made of a durable PVC so you don’t have to worry about how it will hold up. There is going to be a separate fill cap included with your purchase along with an easy on and off valve for controlling the flow of the water. Additionally, the hanging and carrying handle makes it easy to bring it with you wherever you need to do. The capacity is five gallons and the entire product measures just 16 inches by 20 inches and weighs just 14 ounces when it is empty. This is going to be yet another option for you to choose from if you want to find a five gallon shower that can easily hold enough water for multiple showers on just a single fill. Using the solar panels included on the front of the baf, it can heat up water with ease so that you can enjoy warm showers at all times. Additionally, the back is see-through and there is a temperature gauge attached to the bag as well so that both of these things are going to help monitor the water level and the temperature of the water. The storage pocket on the front of the bag is specifically designed to hold soap, shampoo and all of the other accessories you might need to carry. The material of the product is strong and durable so that the strap will hold up under all situations and circumstances. Additionally, it is non-toxic and eco-friendly. Last but not least, this bag comes with a mesh carrying bag so that you can easily transport it with you wherever you go. If you want to find an even smaller shower to chose from because it is only for you, this one might be the perfect option because it is only 2.5 gallons which means it is the perfect size for individual hiking, hunting, fishing and a lot of other adventures you might go on. It is specifically designed to heat the water quickly in the sun and it even comes with a water temperature gauge. The durability of the bag is second to none as it comes with a durable, four-layer construction so that you can easily use the bag without worrying about it breaking. In addition to everything that was discussed above, you’re also going to enjoy an extra large filling valve along with a twist off cap and wide carrying handles for an easy use at all times. The velcro straps help make it easy to carry soap and shampoo with you no matter where you go and it easily rolls up for storage and it is covered by manufacturer warranty. The Coghlan's Camp Shower is excellent although many consider it small. With only three gallons of capacity it does the job. The solar shower takes less time to heat up the water so you can have a bath quickly on the road for a big trip. The material used to build this solar shower is PVA, and it is not reactive towards your skin. You and your family won’t have irritations of skin anymore and it is perfectly within your budget. 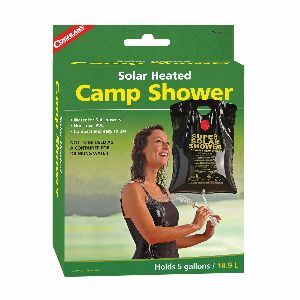 Having a shower with it is fun as it will last 5-10 minutes when you are camping and it is full. Coghlan’s shower is put to best use when you are considering it for dish-washing or quick wash of hands before eating. This shower is easier to transport than any other on my list. You have an incredible 5-gallon capacity that works in your favor for a large family. Not only heats quickly, it also retains the heat inside for long time. You have side pockets in which you can carry soap and shampoo if you so choose. An affordable solar shower if you are on budget cuts. The setup process is easy and it is lightweight to boot. The hanging cord stabilizes the shower itself. It is not as durable as some of the other products on my list. Solar showers are fun when you are looking to have a quality time outdoors. They are particularly made for camping trips, hiking, adventure tours and so on. You can also use them when you need emergency hot water. The brands and models I spoke about in my article are some of the very best solar shower when it comes to portability, water output, temperature control and comfort. You can choose any of them for your comfort without being worried of quality.